One of the greatest challenges of the 21st century is to secure a sustainable energy supply and to considerably reduce CO2 emissions and the serious consequence of climate change. The challenging goals with regard to the contributions of renewable energy cannot be reached without considerable growth of solar thermal markets worldwide. Therefore, costcompetitive, efficient and reliable solar thermal systems are required. 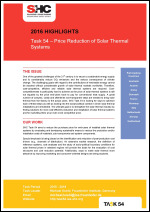 Cost-competitiveness is particularly hard to achieve as the price of solar thermal systems is still not equaled by the price end-users have to pay for conventional heat supply. A great number of complex, costly and oftentimes non-transparent steps are needed to bring solar thermal from the factory to the actual users. SHC Task 54 is looking for ways to optimize each of these steps as well as looking into the social-political context in which solar thermal installations are embedded. The ultimate goal is to strengthen the solar thermal industry by finding solutions for more cost-efficient production and installation of solar thermal systems and for marketing them at an even more competitive price. One of the greatest challenges of the 21st century is to secure a sustainable energy supply and to considerably reduce CO2 emissions and the serious consequence of climate change. The challenging goals with regard to the contributions of renewable energy cannot be reached without considerable growth of solar thermal markets worldwide. Therefore, cost-competitive, efficient and reliable solar thermal systems are required. 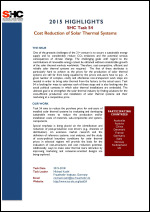 Cost-competitiveness is particularly hard to achieve as the price of solar thermal systems is still not equaled by the price end-users have to pay for conventional heat supply.